Fewer ingredients - InspireMyWorkout.com - A collection of fitness quotes, workout quotes and workout motivation! Fewer ingredients. Not fewer calories. 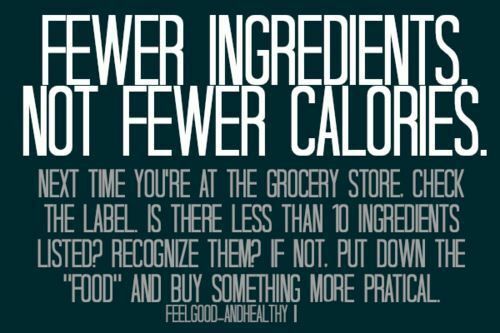 Next time you’re at the grocery store. Check the label. Is there less than 10 ingredients listed? Recognize them? If not. Put down the “food” and buy something more practical.